Appreciate the quality of this invoicing software even on the free product. I have to use this for work. It is very easy to use. The ap does not have a shipping phone number. It has a fax but no phone number! For a small new company, this program is great. Amazing app! This has been a lifesaver with my new business. As I developed a client base the app evolved with me so I never had to change programs! This is s robust, full featured estimating and invoicing software suite. The app gives access to most of the features available on the desktop. Definitely a 5 star app. Has been amazing. Going on a year now! I love it, easy simple to use. We can use zoho with multiple devices for our company. It keeps up with everything we need and has been wonderful for our time using it. This app is perfect for my business needs! As a solo entrepreneur I need tools that are easy to learn and use. Zoho has apps. for me. This app has made keeping track of my projects a breeze. It also lets you know exactly how long a project really takes! Highly recommend to any freelancers! [Long review. TL;dr: Easy access to unimportant information. Things needed are buried. No configuration available.] Main menu has Dashboard, Contacts, Invoices, Expenses, More. There's no way to change these defaults, even if you have no need of Expenses. Dashboard does not show activity. No transaction summary. No chronological list of recent activity. First you get a Total Receivables page, I guess to show just what's outstanding and due. Swipe to get an Income & Expenses bar chart for the past year, because sure, what you need on mobile is an annual retrospective bar chart! No detail, not even if you tap. Swipe again and you get Top Expenses. "Top" in what way? Why only "top"? I don't know. It's not a feature I use, so my page is blank. So the Dashboard is anything but a dashboard. I'd like to see all active clients and summary info of their accounts—invoices, retainers, estimates, project status (hours budgeted, hours used, hours available). I'd like to see a summary of all transactions. And I'd like a transaction history of at least the last week, with each item linked so I can see more detail. All that data is in Zoho, but this app buries it in rabbit holes. The Contacts page is somewhat useful. Tap on a name and you get summary info of how much money is due and how much in unused credits there is. But there is no project status beyond that. From a menu, there are easy links to create invoices, send an email, etc. But even here you can't see any summary project status—not even a list of projects associated with the contact. (Never mind that in Zoho, Projects seem to have been pasted on as an afterthought.) For viewing info, all you can do is view a list of activities. The Invoices page shows only a list of invoices and their status. Tap on one and you can see a boiled down summary of it. But Retainer Invoices do not show up. It would be much better if this page showed all sales transactions. That would be useful. The Expenses page is useless unless you track expenses in Zoho INVOICE. I just do invoicing in Zoho INVOICE. I don't track expenses here. There are far easier tools for that. That leaves the More menu for everything else. Projects is hidden there. Tap on a project and you can see Billed Hours and Unbilled Hours, but not how much credit the project has from retainer. That's because Zoho doesn't even offer any way to connect retainers to projects, only track time to projects. (FEATURE REQUEST: OFFER THE OPTION TO ASSOCIATE RETAINER INVOICES WITH PARTICULAR PROJECTS.) The menu also has links to Estimates, Retainer Invoices, Payments Received, and Credit Notes. Customer Balances is buried down menu under Reports, but no detail is available. And they have the balance as negative if the customer has credit, which seems backwards. Why a distillation of all this info isn't even available in the Dashboard, I don't know. Most frustrating is that none of these page defaults and menu items is configurable under settings. I would like for main options Dashboard, Transactions (all invoices including retainers, and Estimates would be nice), Projects, and Contacts, and the rest could be buried under menus. Other users may want something else, but I think nobody would find the current defaults useful. I love zoho invoice, it makes my invoicing process infinitely easier. I use this app to help run my masonry business easy to use. Zoho has taken a load off of me as a business owner! It has simplified my estimates and invoicing, keeps track of everything for my business. I would recommend this service to any business. It has made so much easier de administration part of my business. I am a freelance graphic designer and I have struggles my whole life trying to find a user friendly method to keep my books. I have even added PayPal for my clients to easily pay. I love it. I’ve been using this for a while. Not a heavy user but it’s perfect for me. I can track everything I need to easily. I can see how scalable it is, too, so I can use it as much as I need as I grow my business. I love love Zoho and all the different programs they offer. ESPECIALLY the Zoho Invoice App. It’s extremely convenient!!! I absolutely have no issues at all!! Keep up the great work Zoho! I can do everything on the run. Easy. Love it! Simple, straightforward, easy to use, and thorough. Everything an app like this should be. Awesome app for business owners. Very easily configurable. This app is very useful and great to work with, so glad I found Zoho!!!!! Very useful, and user friendly. A+ Highly Recommend been using it for 5 years now and it just gets better thanks Zoho keep up the good work. Really like the app. Easy to use and invoices look great and professional. I used to create my own, but this makes it simple even doing my own accounting. I was on the edge at first but after months of using Zoho products I love the interface elegance, simplicity and most of all functionality. The fact that most services are either free or very reasonably priced, it is so hard not to go with Zoho. Job well done, Zoho team! Really great estimating & invoicing creator. 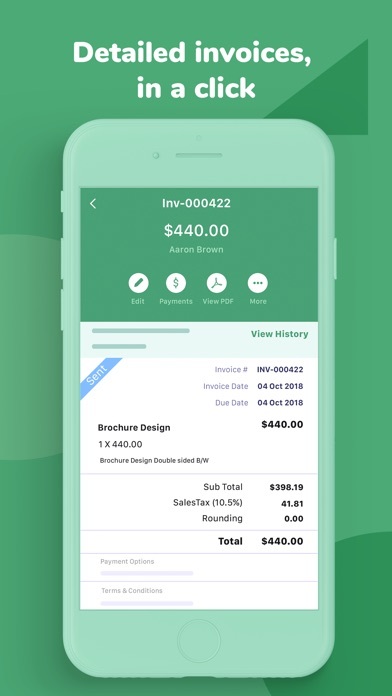 Even if you just want to use it for free, and don’t buy into the whole Zoho backend, it’s a great way to make estimates and invoices quick easy and free and powerful. 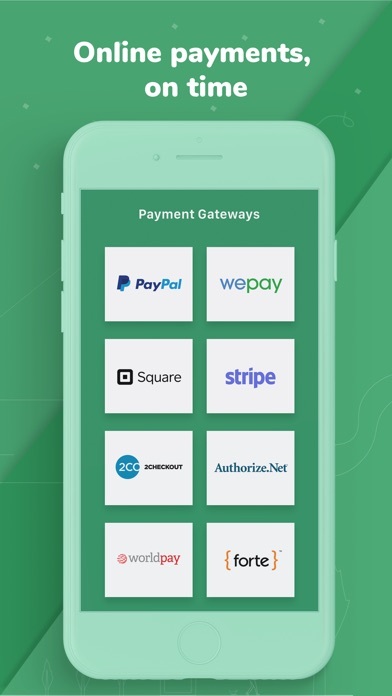 Love the updates ; very good for small businesses to grow; I must admit. Hey all I’ve been using zoho for about four years now and I have never switched. It’s easy to use, intuitive, and makes my business look and feel professional. We love all the new updates and the reliability of the app. Keep it up zoho! Just used for a couple invoices for my tiny startup, works well, we will see how it works as volume increases in the future. Love the paypal integration!!! Works great!!! This is the most convenient app I have ever used. It makes an annoying task so effortless. Love every minute, makes giving estimates and invoices easier. Really steps up my company’s game in professionalism. So far this is perfect for keeping track, and invoicing my contract work. Using Zoho Invoice is so convenient especially with the Paypal Business option. The ability to have recurring invoice is the ability to make corrections on entering payments, and invoice amounts is just what the business needs. This tells the financial story of your accounts receivable. I tried many different invoicing services, I like Zoho the best. I use this app regularly. Nice features, easy to use, and it seems like they update it frequently. I couldn't imagine running my company without Zoho Invoice! Great app. Suggest way to send invoice via snail mail. Es una App que me permite cotizar en menos de 1 min Gracias a su suite tan bien elaborada. Can app link to bank acc? Can app create a delivery note? This app does all it claims! This is an awesome app. All small businesses should use it. Would make your life easier. 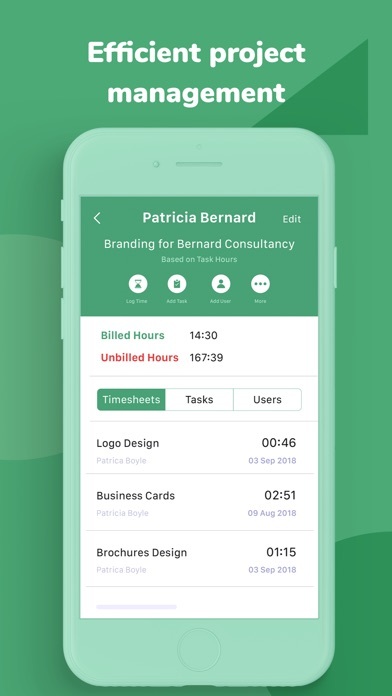 I have use this app for quite a while and for the most part our use it for invoices and I really really like it. Great free replacement for FreshBooks...Made the switch after Freshbooks went to all paid subscription. It does everything Freshbooks did, and just as well. I am enjoying the ability to individualize invoices for my clientele. I can then send a pdf file to the client via text or email for payment. Very slick and professional looking! We absolutely love this app. It is easy to understand and very very convenient. I like a lot of it but need a way to customize expenses more. That's a rigid piece of the app and could be more user-friendly. - be able to create expense categories that they don't list. - be able to hide expense details but have them available for me to see. - customize the invoice email text and thank you email text. - work better with contacts. As it is, it doesn't bring the whole contact info over if you try to do it within the new customer screen. Overall I can do my invoicing, but it's still pretty clunky. I expected more once I bought the subscription. My company has been asking them if they can add a feature to sign the invoice or estimates. They have been saying they have other things they are working on but they’re getting to it. I believe in this day and age a signed invoice or estimate is very important. I hope they get that on their priority list first. Otherwise the app is amazing. I started using Zoho after an independent contractor of mine begin submitting his bi-weekly invoices with this software. At the time I had my own invoicing software but quickly realized that the one I was using was not user-friendly. I made the switch to Zoho and have been 100% pleased with how easy it is to use as well as how stable on their platform seems to be. I now use their program to manage both my photography and transportation businesses. My next plan is to use their entire software suite to further some of my other business interests. I love the fact that they keep prices down by not advertising during Super Bowl commercials! After watching their YouTube videos it’s apparent that they are all about the quality of their product versus an over arching image of who they want people to think they are. Oh, and what I also love about their product is that I can manage my businesses across many different platforms: iPhone, iPad, desktop, etc. If somebody is considering them I recommend you pull the trigger and at least utilize their 30 day free trial, I think you’ll be hooked and will choose to stay with them like I did! 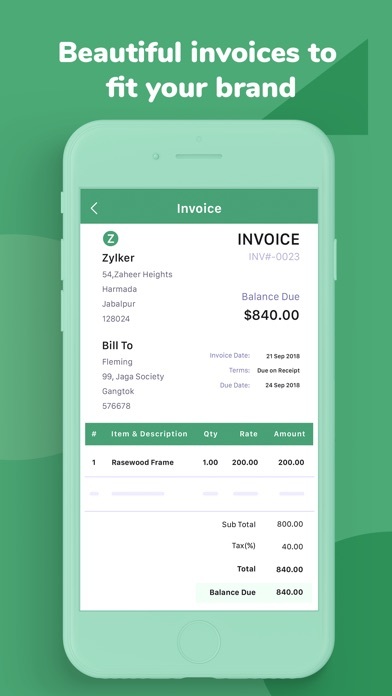 I frequently use this app to create and send invoices while on site with my clients. Bottom line, this Zoho app is simpler,easier, and quicker than the zoho website. 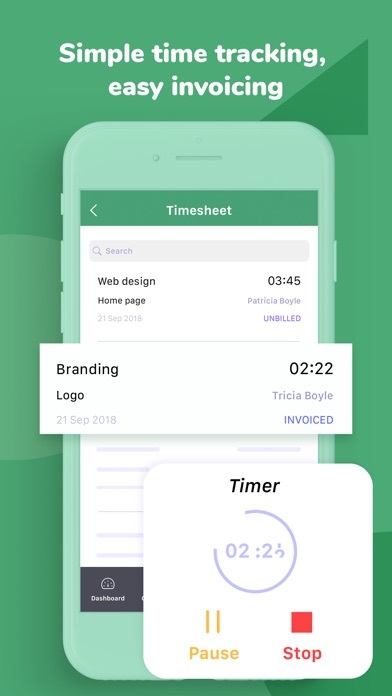 The most professional and easy to use invoice app and system I’ve tried.